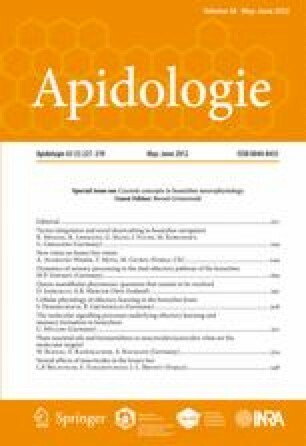 The parasitic mite Varroa destructor is the main cause of the severe reduction in beekeeping during the last few decades. Therefore, efforts have been made to develop chemical treatments against the parasite. In the past, synthetic products were preferentially used to combat Varroa mites. Nowadays, mainly plant essential oils and organic acids are applied because they are safer and impose less unfavorable effects on the environment. Essential oils contain mixtures of mostly volatile and odorous terpenoid constituents. The molecular targets of these substances are tyramine and/or octopamine receptors that control and modulate vital functions ranging from metabolism to behavior. Disturbing the native function of these receptors in the mite results in deleterious effects in this parasite. This overview considers not only tyramine and octopamine receptors but also other potential targets of essential oils including ionotropic GABAA receptors, TRP type ion channels, and acetylcholinesterase. We wish to thank Prof. B. Grünewald (Oberursel) for the invitation to submit this review article. The work of the authors was supported by the German Science Foundation (BL 469/7). Huiles essentielles de plantes et formamidines, comme insecticides/acaricides: quelles sont leurs cibles moléculaires? Ätherische Öle und Formamidine als Insektizide/Akarizide. Welches sind die molekularen Wirkorte?